Reps. Margo Davidson and Leanne Krueger-Braneky (right) at an anti-Trump rally in Delaware County last February. You think you've had a busy holiday season? Try being Delaware County Democratic State Rep. Leanne Krueger-Braneky, who — in the spirit of Santa Claus, perhaps — has been flying all over the political map in recent days, speaking up and taking a stand for a fast-spreading revolution in female empowerment that must be gaining some traction if it's actually reached Pennsylvania, the state where women's movements historically go to die. While you were out hunting down Christmas bargains, Krueger-Braneky has sponsored legislation in Harrisburg that would end the boys-club rules that for decades have helped cover up sexual misconduct by male legislators, stood with Gov. Wolf as he vetoed GOP-passed legislation that would have imposed one of the nation's strictest antiabortion laws on Pennsylvania women, and this week called for the resignation of two fellow Democratic lawmakers whose bad conduct has been exposed in the growing tidal wave of #MeToo. "I think the #MeToo movement has opened up a broader conversation on the problems that have always been here," Krueger-Braneky told me this week. And No. 1 on that list in Pennsylvania is the stunning lack of female elected officials. We are currently 49th of the 50 states in women holding political office, ahead of only Mississippi. Globally, women get elected at a higher rate in Afghanistan than they do here. Pennsylvania has never, in its more than two centuries, had a female governor, U.S. senator, or mayor of its largest city, Philadelphia. In the current 18-person delegation in the U.S. House, the rate of women is — hold on, let me take out my calculator … zero percent. It's a bad look, but the bigger problem is how the lack of diversity — gender and otherwise — makes for bad public policy. "I think we see the impact of the lack of women," said Krueger-Braneky, "on everything from how poorly budget negotiations have gone, with no women at the table, to the ultra-right-wing agenda of the House speaker" — Republican Mike Turzai — "and his colleagues." Krueger-Braneky noted that while GOP lawmakers in Harrisburg were passing that extremist antiabortion bill despite the certainty of a veto by Democrat Wolf, legislation she's cosponsored to increase access to birth control — the best evidence-based way to actually curb the number of unwanted pregnancies and abortions — remains hopelessly bottled up in committee. She said she went to Harrisburg after her surprise win in a 2015 special election hoping to work on economic development, her specialty, but instead has been forced to focus her time fighting what she calls "a constant attack on basic human rights." It wasn't supposed to be this way. Does anyone still remember "the Year of the Woman" in American politics? It was 1992, and it was inspired by arguably the original #MeToo moment in American politics, the charged Senate hearings over allegations that Supreme Court nominee Clarence Thomas had sexually harassed his coworker Anita Hill. The episode highlighted not only the issue of workplace harassment but also America's stunning lack of female elected officials, even after the women's liberation movement of the 1970s. The epicenter of "the Year of the Woman" that followed the Anita Hill case was supposed to be here in Pennsylvania because it was the late Sen. Arlen Specter — then a Republican, facing what had been before all of this viewed as an easy reelection campaign in 1992 — who had conducted a fiery cross-examination of Hill. Indeed, a virtually unknown woman named Lynn Yeakel shocked the state's political establishment by running a brilliant ad lambasting Specter's conduct in the hearings and winning the Democratic nomination to oppose him. At the time of Yeakel's nomination, the Keystone State had not only never had a female senator but the only three congresswomen in Pennsylvania history had been widows taking the seats of their late husbands. But by autumn of that original "Year of the Woman," Pennsylvania had very much reverted to form. Yeakel — like many a woman flying too close to the rarefied air of the great glass ceiling — suddenly saw questions about her "lack of experience" or her "temperament," questions no doubt fueled by the millions that Specter had pulled in from his wealthy donors. She lost by a few percentage points — and that defeat established the sexist playbook for tearing down female candidates that the GOP would use again in 2016 when the next woman to win a Senate nomination was mercilessly hectored as "shady Katie McGinty." But there's reason to believe that the looming new year really will be different this time around. The headwinds of the Anita Hill affair a quarter-century ago are nothing when compared with the hurricane that's been generated over the last 13 months by the presidential election loss by Hillary Clinton to admitted-female-genital-grabber Donald Trump, the January 2017 Women's March that drew some four million participants, and — not at all coincidentally — the courage of so many women to come forward with their stories of gender harassment and abuse, first to investigative reporters and eventually online. Female voters and their door-to-door activism were linked to a mini-surge in surprise Democratic victories in off-off-year elections in places like Krueger-Braneky's own Delaware County. Now those sharp winds are even whipping the once-isolated banks of the Susquehanna River. In recent days, great investigative journalism by my Inquirer and Daily News colleagues has exposed allegations of serious misconduct by the departing chair of the state Board of Education and by two lawmakers, State Sen. Daylin Leach and State Rep. Thomas Caltagirone. Increasingly, Harrisburg's small band of female legislators are demanding action — even if it hurts their own party in the short run. Krueger-Braneky on Thursday called on Twitter for colleague Caltagirone's resignation, stating "it hurts" but that "[w]omen elected officials, staff, and interns deserve better than to find out in the paper that a powerful colleague has a concerning history of harassment claims against him." The Delco lawmaker also said she's drawing bipartisan support for her bill that would reform how the legislature handles future cases, by barring nondisclosure agreements and the use of taxpayer dollars to settle claims. And that's before what advocates are hoping will be a small tsunami of female candidates, most of them seeking office for the first time, that could radically reshape Harrisburg — assuming, that is, the newcomers can cash in on the same anger that anti-Trump suburban women flashed in the fall of 2017. 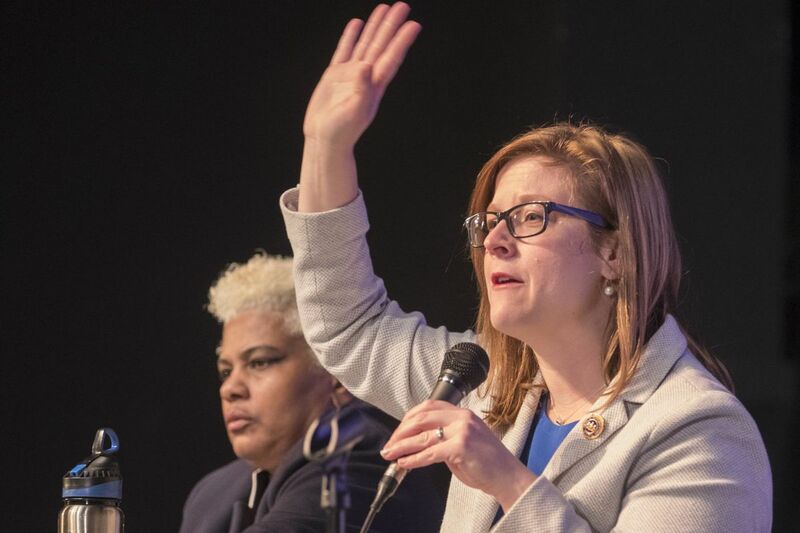 Krueger-Braneky said Democrats have already seen 31 new women candidates come forward vowing to challenge GOP incumbent state legislators in 2018, and more are expected before the filing deadline in March. Few fit the bill better than Jennifer O'Mara, a 28-year-old University of Pennsylvania administrator and education advocate from Springfield seeking to challenge GOP incumbent Rep. Alex Charlton in the 165th House District, next door to Krueger-Braneky. Touting her blue-collar upbringing in Prospect Park, working three jobs to become the first in her family to graduate from college, Democrat O'Mara said she entered the race after both seeing the impact of bad policies coming out of Harrisburg and how little the legislature resembles the real Pennsylvania. "I looked at politics and I was not seeing enough people who looked like me," said O'Mara, who said that includes women but also other groups with little current voice in state politics, such as young people and working-class folks. She said she worked a 10-hour day visiting polling places in the recent November election and met many women voters, some with their children in tow, who told her that putting more females in office was their goal, even ahead of political party. "They say if you're not sitting at the table," she told me, "you're on the menu." Now female candidates and their advocates are hoping 2018 will be their year for a veritable feast. Hey, it's only been 26 years in the making, but political revenge is a dish best served cold, right?